In the past week, MLB rooks have taken a stand against the simple stats and are rewriting the record books. In fact, three of them are starting a new trend for Generation Y and have made the official move to making your first MLB home run not a solo shot but a grand slam. That’s right, three have hit grand slams this week as their first MLB homers. Two did it in their first game. One did it on the first pitch they saw. So who are these mystery three. Let’s start with the most recent. Mike Stanton – If you haven’t heard of this top prospect yet, he is the next coming of Mark Reynolds and Adam Dunn. A very powerful, even more free swinging batter with little concern of setting the single season strike out record. He is one of the Marlins top prospects who got his Major League call-up on June 8. He hasn’t wow’ed anyone by any means yet… that was until tonight. On his 32nd MLB at-bat, he had the bases loaded against the Rays Matt Garza. He battled his way to a 3-2 count when he lifted a high fast ball to left field. The crowd reacted similar to Jason Heyward’s first home run. But Stanton’s was a grand slam. He helped knock Garza out of the game after 1 1/3 innings and 71 pitches. Now that he’s broken the ice, you should expect many more long balls from him in years to come. Aaron Cunningham – I don’t know a lot about this guy, but I do know he made his first home run even more impressive than Stanton’s. In his first Major League game on Tuesday June 15 on his 3rd ever Major League at-bat, Cunningham came up with the bases loaded against Brett Cecil (who has been white hot this season for the Blue Jays). He knew what he had to do for Generation Y… and he did. 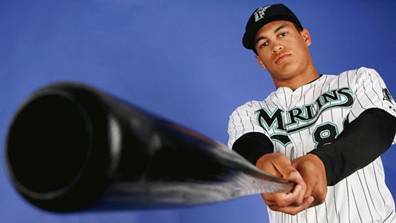 His first MLB home run was also a grand slam. Daniel Nava – Of course, the Boston Red Sox player has to show everyone up. Nava came to the plate for his very first at bat on Saturday June 12 with the pond full. On the very first pitch Nava saw, he took it yard. That’s right, after one pitch, Nava was 1-1 with 4 rbi’s and an OPS of 5.00. I hate to say it, but there’s no where to go now but down, Nava. Carlos Santana (not the singer) – He’s only been up a little while but is already the starting catcher and batting 3rd for the Indians with a 0.333 BA, 4 R, 1 HR, and 5 RBI. Buster Posey – Batting in an anemic Giants offense, he’s a catcher who is playing first and is sporting a 0.324 BA, 8 R, 1 HR, and 7 RBI. Ike Davis – He made his debut on April 19 for the Mets and he has rewarded the front office since then. He has made several unbelievable over the railing catches at first. As well as posting 33 R, 8 HR, and 26 RBI. He’s a big reason the Mets are in first and already has one career walk-off home run. Justin Smoak – He disappointed in his first few weeks, but since then he has turned it around at 1B for the Rangers. He hit his 7th HR last night and has 28 RBI. This is the prospect that knocked Chris Davis back to the minors. Starlin Castro – He hasn’t done much for the Cubs since his first game, but what a debut he had. In his first game on May 7, he went 2 for 5 with a triple and a HR with 6 RBI (which is a new record for RBI in a MLB debut). The HR was in his first at-bat too. Austin Jackson – He has been with the Tigers all season and has been a menace at the top of the lineup. Batting 0.308 with 36 Runs and 10 SB. He also made an amazing over the shoulder catch in the Galarraga not no-hitter Those numbers would be even stronger if he hadn’t been listed as day-to-day for the past week. Jason Heyward – He was the first big name to make an entrance this season making his debut with the Braves at the beginning of the season. In his first at bat, he went yard and that was only the beginning. He already has 11 HR with 44 RBI this season and has been dubbed by the Fantasy 06010 as the Kraken. Mike Leake – This pitcher is almost more impressive than Strasburg for one reason: He has NEVER pitched in the minors. Not a single game. He got drafted in 2009 as the 8th overall pick for the Reds and has helped catapult them to the lead of the NL Central. He’s having a bit of a rough June but prior to that he was 5-0 with a 2.22 ERA. Jamie Garcia – He actually pitched 16 innings back in 2008 for the Cardinals, but he still qualifies as a rookie this season and what a 2010 season he is having for the red birds. He has a sparkling 1.59 ERA and is posting a decent 2:1 K/BB ratio. And he isn’t showing any signs of slowing down this season. Which is good news for the Cards who had to deal with the Brad Penny debacle and now will be living on small rations of “Soup”. Stephen Strasburg – Of course he belongs on this list. His command is incredible. His fastball is lightening fast. His change-up is like a Sunday driver. He is a robot. If it weren’t for the whole Cleveland grounds crew incident, he would have 0 walks, but instead he has 5 BB to his 32 K’s through 3 games. Those 32 K’s is an MLB record for most strikeouts by a pitcher in his first 3 MLB games dating all the way back to 1900. His ERA sits at 1.86, he is 2-0, and his WHIP is below 1.00. 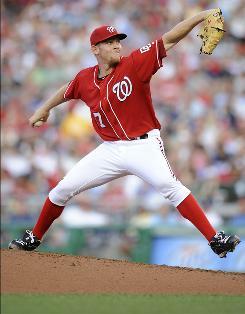 As long as the Nationals remember to oil him and don’t leave him out in the rain to rust, Strasburg is going to dominate. So if you get a chance, go check him out live. There it is, my list of players’ names you should get used to hearing, seeing, and drafting. Go ahead and make your case for names I left off the list in the comments section below. I don’t expect any as I am all knowing when it comes to baseball… ok, maybe not.